*Keep in mind that self-restoration projects often compound the problem and require professional help. Before starting a repair on a leaky ceiling, call Emergency Restoration in Las Vegas for professional consultation and assistance for your water damaged ceiling. After identifying the source of the water damage, turn off the water. You need the area to be completely dry before taking any action to repair it. This step needs to happen as soon as you find the leak. The quicker you flip the switch, the less of a chance for mold growth and increased structural damage. It’s time to swallow your pride and pull out a pot or bucket. That dripping water won’t catch itself! If you are inexperienced at dealing with electrical wire, punching out ceilings, or patching roofs, stop reading now and skip to Step 7. Attempting a DIY water damage restoration project with limited experience isn’t only extremely challenging, it’s dangerous. If you feel very comfortable doing the above, check for anything dangerous on the other side of the ceiling (wires, mold, rotting wood, etc.). After deeming the area safe, carefully cut out the affected area with a sturdy utility knife. (That’s right, you’re going to chop down your ceiling.) At this point you’ll want to make sure that you have all the right tools and experience to properly repair your ceiling. Water leaves it tracks. After discovering a leaky ceiling and cutting out the affected area, use sandpaper to smooth the bumps and ridges in your ceiling. Also, make note of where the metal joists are located in your ceiling. These will be used in the next step when you attach new drywall. Obtain a piece of drywall and cut a patch that matches perfectly. Secure the drywall to the ceiling using screws or nails (space them 4 to 6 inches apart). 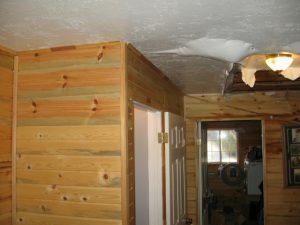 To make the ceiling more secure, attach a plywood brace before you insert the drywall. If the ceiling is under too much stress, this will provide added support. Don’t forget that when handling drywall, some people experience allergic reactions or find drywall hard to maneuver. Call ERX in Las Vegas for your water damage needs. Sand the drywall and surrounding area to make it appear seamless. Then paint layers of joint compound, primer, and paint (in that order). Touch up as needed and viola! You have a new ceiling! Although the above steps are good starting points, repairing a water damaged ceiling on your own nearly surpasses a DIY project. Professionals will not only repair your ceiling, but identify the source of damage. Without getting to the root cause of water damage, you may have another leaky roof in a week or so. Give ERX Emergency Restoration in Las Vegas a call today.